Invited to a Hatch chile themed food blogger potluck in Austin, I decided to make chocolate truffles infused with Hatch chiles. 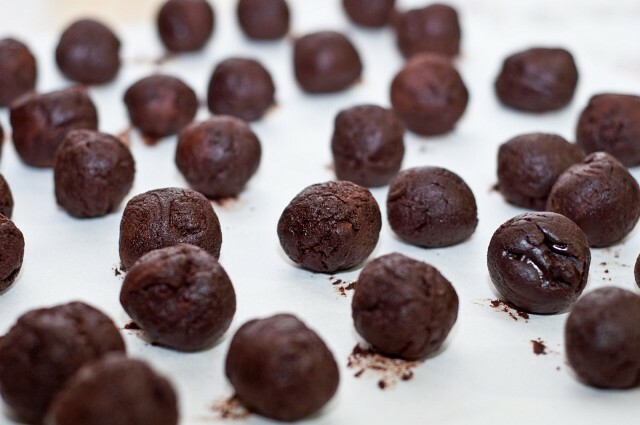 The exercise didn't go exactly as planned (probably due to procrastination and waiting until the last possible day to make them without any trials beforehand), but it was still fun and I think the truffles turned out pretty well. Here's what I did. I had previously cooked five mild Hatch chiles in butter after julienning and cleaning them. I had tasted the chiles at that point and found them spicier than I expected with a flavor like a green bell pepper (but with heat). 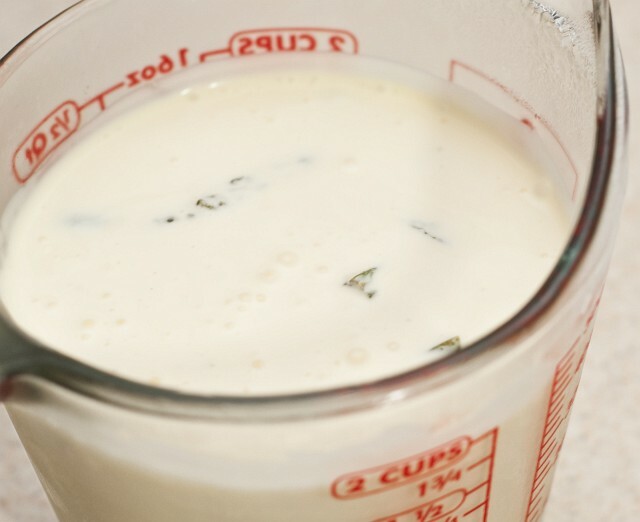 I soaked about one chile's worth of strips in heavy cream in the refrigerator for a full day - hoping to infuse the chile flavor into the cream. This works extremely well with citrus zest and vanilla, so I thought I'd try it. 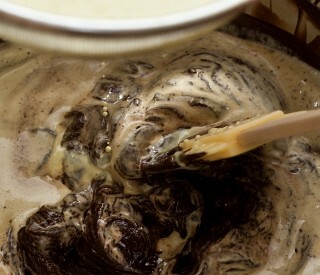 After the chile had soaked in the cream for a day, I started to prepare for the truffle making. 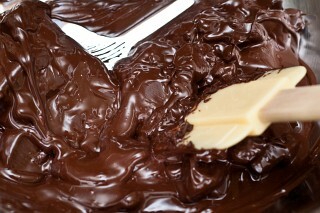 I started cutting 500 g dark chocolate for the ganache, but that soon tired me out. I tried running the chocolate through my blender, but that failed (the chocolate block just jumps around). My large food processor was packed up still and the small one I had available didn't have a shredding disc, so I skipped trying that. 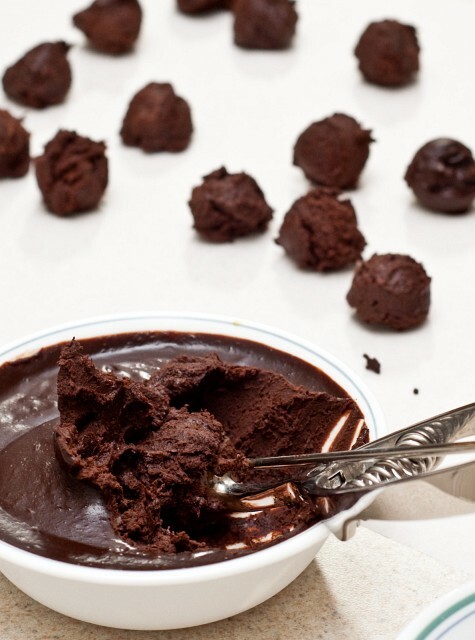 Normally, when I make truffles, I don't melt the chocolate - letting the cream do that, but that only works if you chop the chocolate very fine. I roughly chopped up the rest of the chocolate, poured it all in a large metal bowl, and fashioned at double boiler by setting that on top of a saucepan with some water. 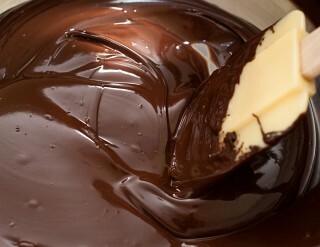 Gently heating the chocolate, I gradually allowed it to melt. Once all the little pieces were melted and the larger chunks had softened, I removed the bowl from the heat. 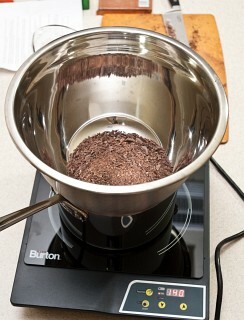 After stirring for a bit, the chocolate was smooth as silk. Meanwhile, I tasted the cream and could barely detect a hint of the Hatch chiles. Odd, since I thought the chiles tasted fairly strong a couple days before. 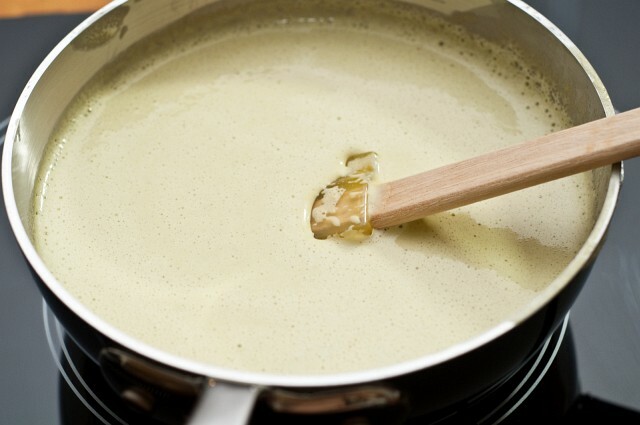 I decided to puree some of the chiles directly into the cream. Blending the cream was a mistake (but easily repairable). It only blended for a few seconds and then it stopped moving. 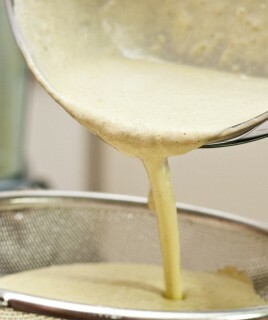 I took a look inside the blender's carafe and discovered I had whipped the cream to stiff peaks. 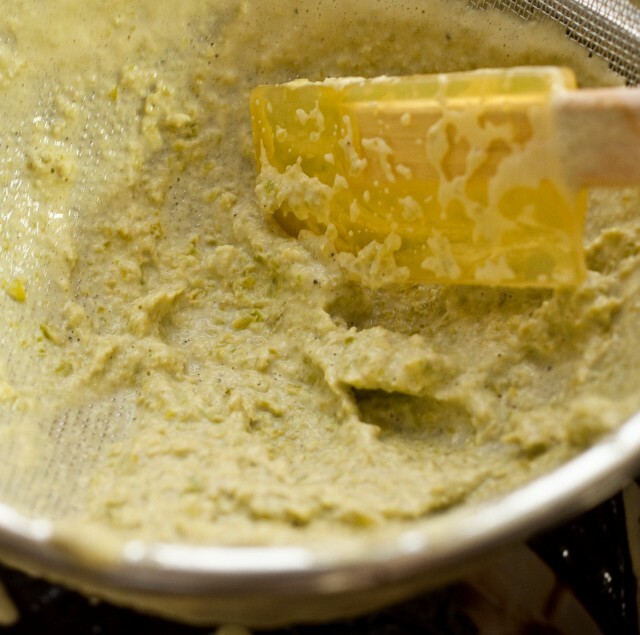 I scooped it out into a small saucepan to melt - it really looked like Hatch chile ice cream. 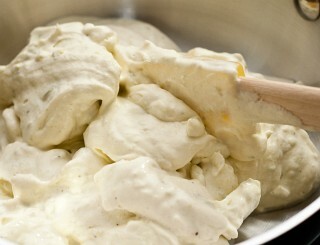 At this point, I thought "why didn't I decide to make Hatch chile ice cream instead?". Too late - I gently heated the whipped cream until it melted. It still wasn't flavorful enough, so I kept adding more chiles and blending (since it was warm/hot the cream didn't set up like before). I wanted the truffles to be subtly flavored, but I was also concerned that the other people at the potluck would have eaten a whole meal based around Hatch chiles so they might not taste the chile if it was too subtle. In the end, I pureed all of the chiles that I had into the cream. 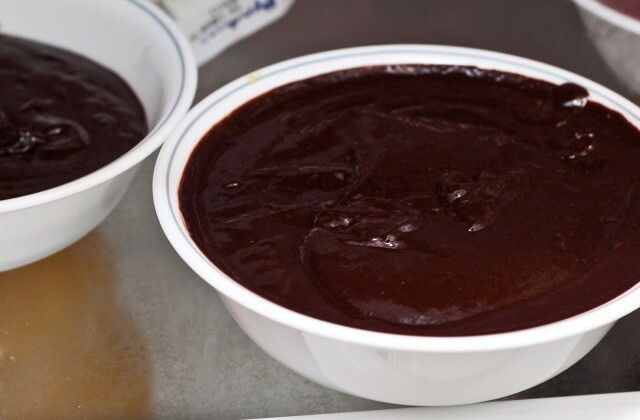 After scalding the cream, I let it cool for a few minutes, then poured it through a fine sieve to keep any Hatch chile bits out (the skin is notoriously chewy) and ensure the ganache would be uniform and finely textured. I stirred the cream into the chocolate while chanting "don't seize, don't seize, don't seize". It's been a while since I've practiced confectionery and this is the first time I've worked with chocolate in this particular kitchen (which is at a higher altitude, higher temperature, and high humidity than where I cooked for my whole life) - so there was a certain amount of fear that it wouldn't come together. I set aside the solids that were strained out (and mixed it with some spices and seasoning into ricotta cheese to use for a cheese and cracker appetizer). 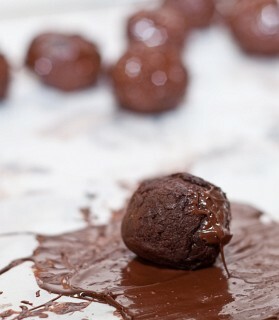 Using a disher, I scooped out "balls" of ganache (it was more like clumps) onto a large sheet of parchment paper. I normally work on Silpats, but they're still packed up. 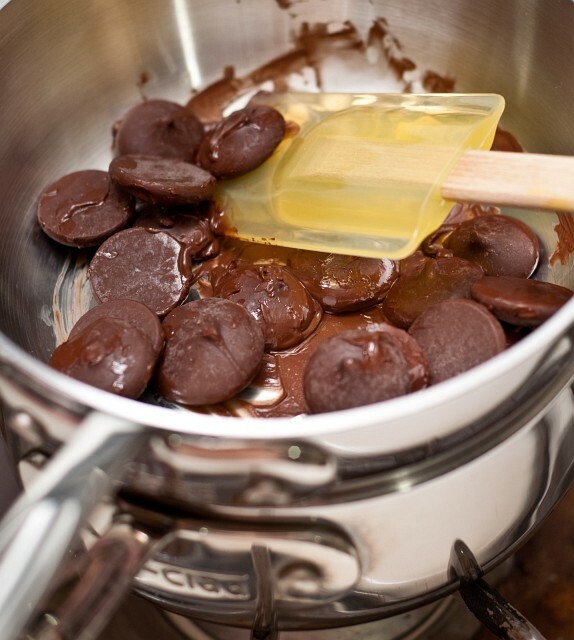 I then took a few ounces of Ghirardelli dark chocolate drops and melted in a small saucier set over a small saucepan (with some water). I then slowly cooled the chocolate until 88 degrees and held it there by moving it over a warm pan of water and taking it off while stirring to moderate the temperature. I managed to do this for about five straight minutes. I then attempted to roll one of the ganache balls in the tempered chocolate, but it became tacky and the chocolate coating was spiky from sticking to my hands. Normally, I use vinyl gloves which help keep the chocolate from sticking to the fingers, but those are packed away too. 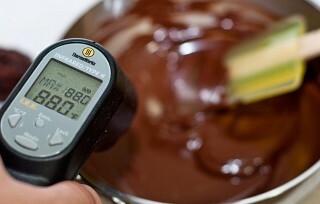 In addition, the temperature of the room (a bit over 80°F) was a bit too high to efficiently work with the chocolates. I had allowed the ganache to sit at room temperature before coating because if I they were too cold, the chocolate coating could shrink too fast around the the ganache and crack. Unfortunately, the room temperature was too warm, and I had to chill the ganache. 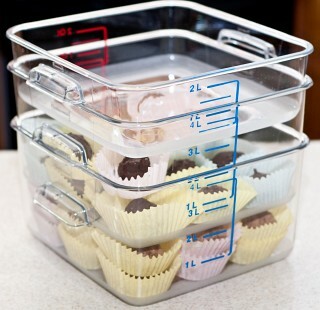 I transferred the ganache clumps from the parchment paper on the counter to a sheet of parchment paper set over a cookie sheet (I couldn't just slide the parchment paper I had been working on onto a sheet pan like I normally work because (a) my sheet pans are all packed away and (b) this particular house has a side-by-side refrigerator which wouldn't have enough shelf space to fit a sheet pan) and chilled it for fifteen minutes. Afterward, I rolled the clumps into rough balls. At this point, I had to reheat my chocolate a little - losing my temper. (That's ambiguous: I didn't lose my temper - the tempering that I had performed on the chocolate was lost.) I tried to coat the truffles by hand again, but my hand is not non-stick without gloves on and it just wasn't working very well. I then ripped off a square of parchment paper and placed that in my hand and tried rolling it on the paper with the other hand, but that got chocolate and ganache all over the other hand and not much on the actual truffle. Finally, I ended up rolling the ganache in chocolate using a silicone spatula with the parchment paper lying on the counter. This seemed to work fairly well - but by now I was running low on chocolate since I lost a whole bunch with each failed trial (a lot stuck to my hand and got washed down the drain as I washed them between attempts). Not wanting to deal with it any longer, I decided to just coat the ganache in Ghirardelli ground chocolate powder. This was actually what Tina told me to do from the beginning but I wanted to chocolate coat them. This is a good reason to listen to your wife - often it's the easier solution. 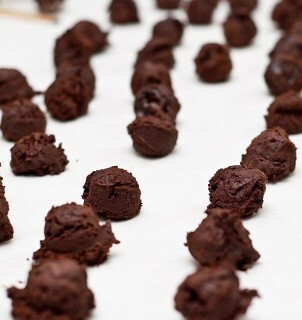 Finally, I finished coating all the truffles. I chilled them for 30 minutes and then set them in individual cups. I didn't have confectionery cups, so I resorted to using muffin cups (which, luckily, were in a box that was already opened). 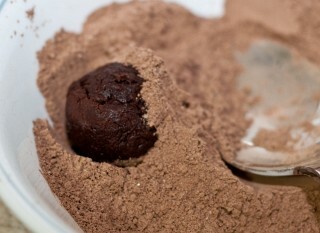 I ran out of muffin cups and only had one truffle left - so I ate it. It had a smooth, creamy interior with a hint of Hatch fruitiness followed by a mild tingle on the tongue and back of the throat that lasted just a few seconds. Pretty good, I thought to myself. I stacked them in a couple of food storage containers, creating a multilayer stackup where I could drop ice bags on top for the hour or more of transportation time (I currently reside twenty miles south of Austin and the pot luck is in North Austin). I should probably also explain that we're in between moves. We moved a few months ago and will be moving again in a couple months - so we want to unpack or open as few boxes as possible. Some of the problems could have been avoided had I just opened a few more moving boxes, but I managed to produce the truffles without busting anything open, so, at least in that respect, this was a success! 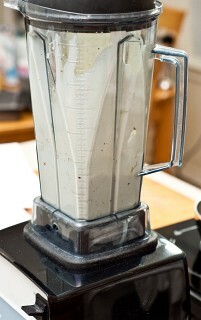 Hi Michael--is that a Blendtec or VitaMix (or neither)? 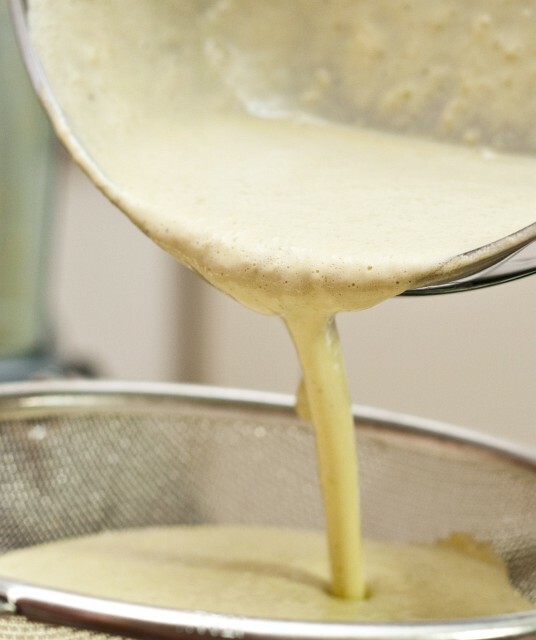 I am in the process of trying to upgrade our blender, and I'm certain that I could convince my husband if I knew what you had. Thanks! That one is a VitaMix. One of the lower end models. I would prefer to have the model with the variable speed dial, but, since this one works really well, I never got around to buying another. My mouth is watering just looking at these photos. I've made truffles for Christmas the past few years. Getting the temperature just right seems to be the tricky part. One year I easily coated the ganache with melted chocolate, another year it was just awful. Subject: Desset and appetizer both! Using the solids that you strained out of your Hatch mixture for crackers is a genius idea! I've run into that problem making peppermint patties, and a method that worked reasonably well is dipping the with tongs or setting the truffle on a fork and lowering it into the chocolate until covered, and then slowly bringing it back up, letting the chocolate run through the tongs. Great job anyways! If you guys could put together a printed cookbook for purchase, that would be awesome. Thanks. I'm drooling - I spent most of my adult life about an hour's drive from Hatch, NM, before moving to the Netherlands 2 years ago. Here, you can't even get canned green chiles, let alone Hatch chiles. I miss the smell of chiles roasting all over town in August. Anyway, they look fantastic, but I thought I'd put in my two cents. 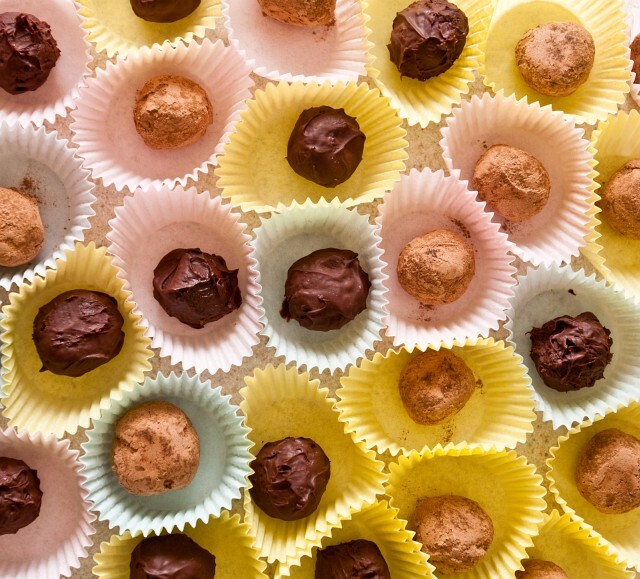 I like to roll truffles in cocoa and THEN coat in chocolate. The cocoa takes away the stickiness of the ganache (I do it all bare-handed), and you can work with them at room temp very easily. Favorite truffle flavor: caramel with fleur de sel. Dairy's ability to extinguish might explain why your fiery peppers failed to sufficiently spice up the cream. I love yours recipes! This is the best cooking site on the world!